Looking for a couple of these.. driving me mad! This is just one of those stupid little things but do you think I can find one, that doesn't come semi fixed to a rifle stock sheath for about 20 quid. My son is due to play his first game soon, he's playing as a sniper with a Dan Wesson 6 as a side arm. He wears a vest with velcro available at the top left shoulder. 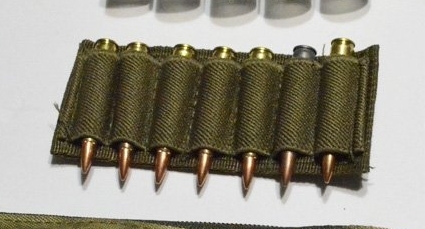 He would like a couple of the panel shown here to take a shell akin to the calibre of a 38/9mm, NOT a shotgun shell that 99% of them seem to be made for. Can anybody pleeease point me in the right direction, I'd be very appreciative. Have you tried hoopers in Norwich ? I haven't yet no. I don't get into the city much. Trick is to describe the item you're looking for in google images, best i've got for it is ".38 rifle cartridge card velcro". I don't even know if .38 is even a type of rifle ammo, but I'm not so dense as to not know its only a fraction larger than 9mm. The operative word appears to be "card" when searching for these though, I had my breakthrough while describing the item when I added "hunter" to my image search. I couldnt find what you were looking for in the UK, but i'm lazy and never went off the first page of results. I would recommend just finding some listings priced right and click "contact seller" and ask how snugly 9mm rounds fit, and whether the ammo card is fixed or Velcro. Alternatively, if you have sewing machine you'll probably get best results that way.